GROW YOUR OWN AND SAVE! For those of you with experience we offer starter heucheras. 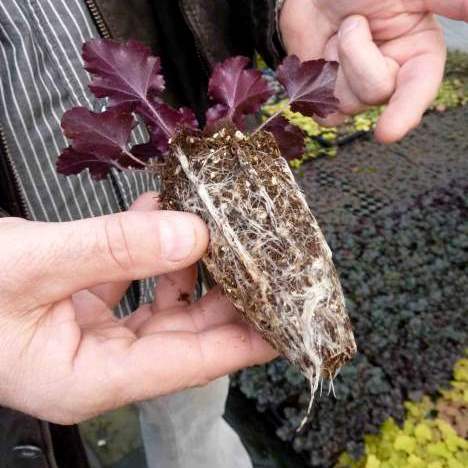 These are stage-4 tissue cultured plants shipped as very small liners. You can expect 2-4 leaves and a small set of roots on each plant. These coral bells need some extra care and they are not recommended for beginners. These starter plants are shipped "unpotted" with the starter soil still intact. Plant immediately upon arrival. • Liners should be grown in containers for several weeks-months before being planted into the ground. • Use a well drained, bark based, soilless mix. • A constant liquid feed at 50-100ppm nitrogen is recommended. • Maintain a soil PH of 5.5-6.5.